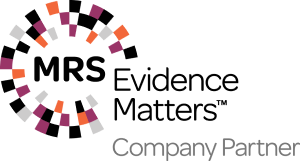 In an online survey of 2,026 Londoners on behalf of the London Fairness Commission, Survation has explored attitudes of London residents towards issues of fairness in their city. 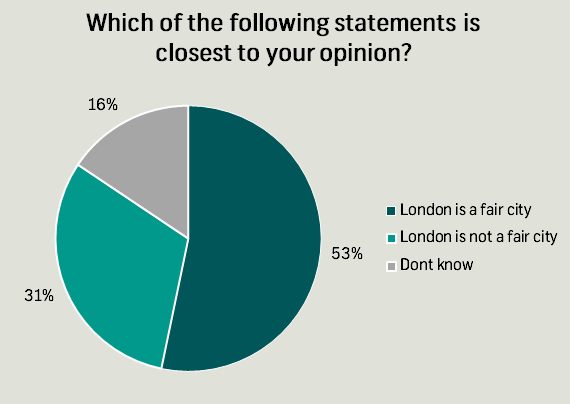 Overall, 53% of residents in the capital think that London is a fair city, but below this headline finding lie a number of key concerns. 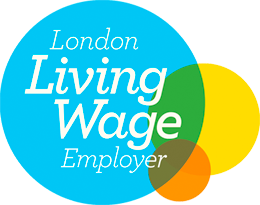 These are particularly focussed around economic issues – 51% of Londoners think that the wage they receive is not a fair reflection of what they do at work and only 26% report feeling that their wages have kept pace with the rising cost of living over the last two years. 78% of Londoners want the capital to have a higher minimum wage level than the rest of the UK, reflecting concerns about the high cost of living in London. 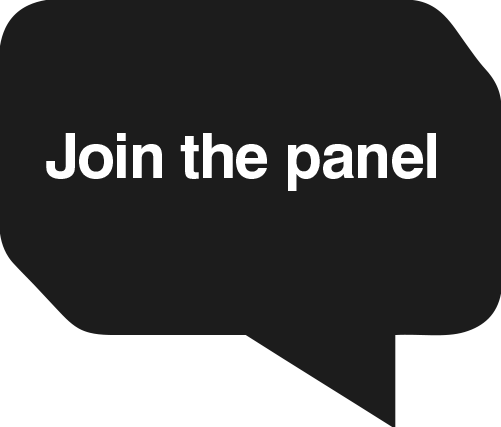 Meanwhile, looking at the top end, 57% of respondents expressed the view that it was not fair for some to be paid very high salaries while others in London are struggling to get by. The vast majority of Londoners, 79%, feel that it would be unfair for the CEO of an organisation that employs minimum wage earners to be earning more than £500,000 themselves – a view that was held even by 70% of those intending to vote Conservative in next year’s Mayoral election. 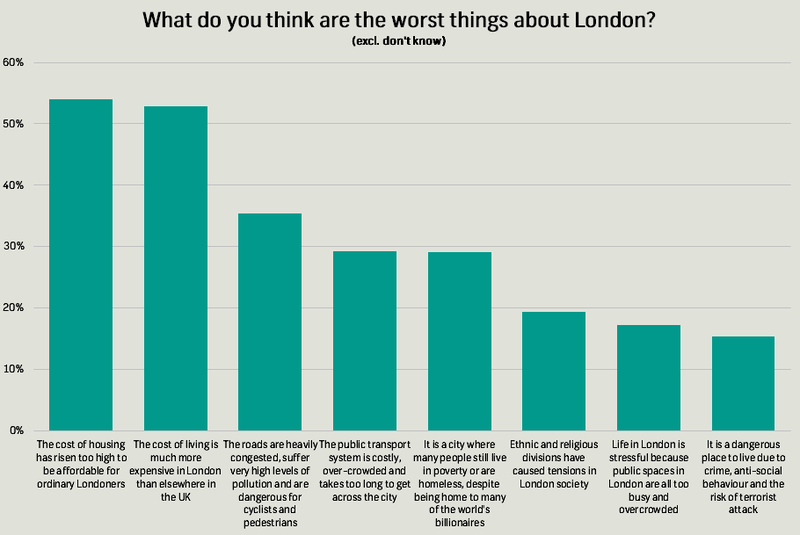 Two thirds of Londoners think anything above £200,000 would be unfair. 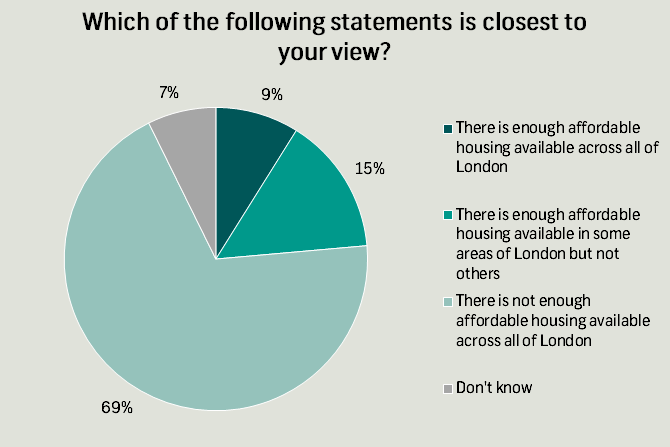 Housing was another area of major concern, with 69% of respondents feeling that there is not enough affordable housing across all areas of London. 61% of Londoners polled would support an extension of council tax bands for those in more expensive homes. 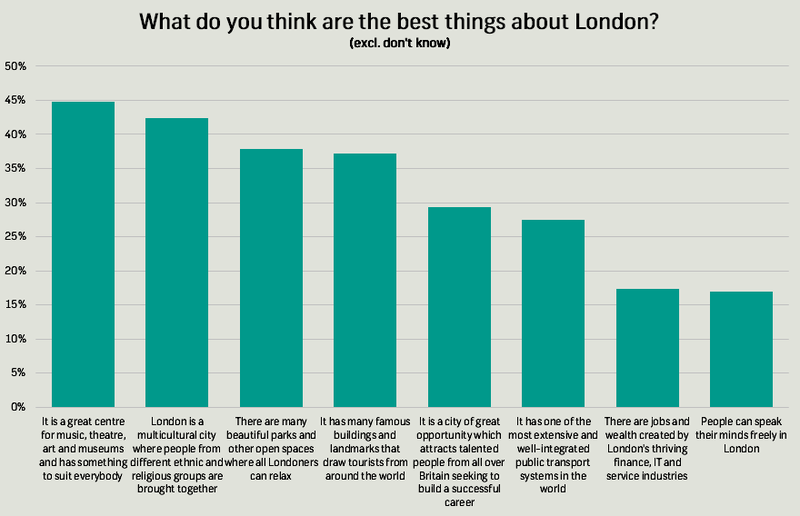 As well as these topics, the poll looked at what Londoners love and hate the most about their city. Top positives were that London “is a great centre for music, theatre, art and museums and has something to suit everybody” (one of the top three things for 45% of respondents), particularly valued by older residents, and that “London is a multicultural city where people from different ethnic and religious groups are brought together” (42%), which was the top response from Londoners aged 18-34. 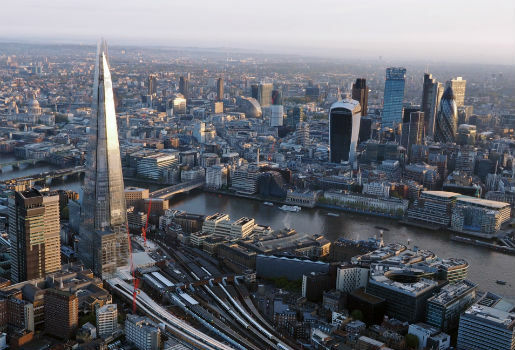 The worst things about London were both financial – that “the cost of housing has risen too high to be affordable for ordinary Londoners” (54%) and “the cost of living is much more expensive in London than elsewhere in the UK” (53%).